The onset of self-organized droplet motion is studied in a poroelastic two-phase model with free boundaries and substrate friction. In the model, an active, gel-like phase and a passive, fluid-like phase interpenetrate on small length scales. A feedback loop between a chemical regulator, mechanical deformations, and induced fluid flow gives rise to oscillatory and irregular droplet motion accompanied by spatio-temporal contraction patterns inside the droplet. 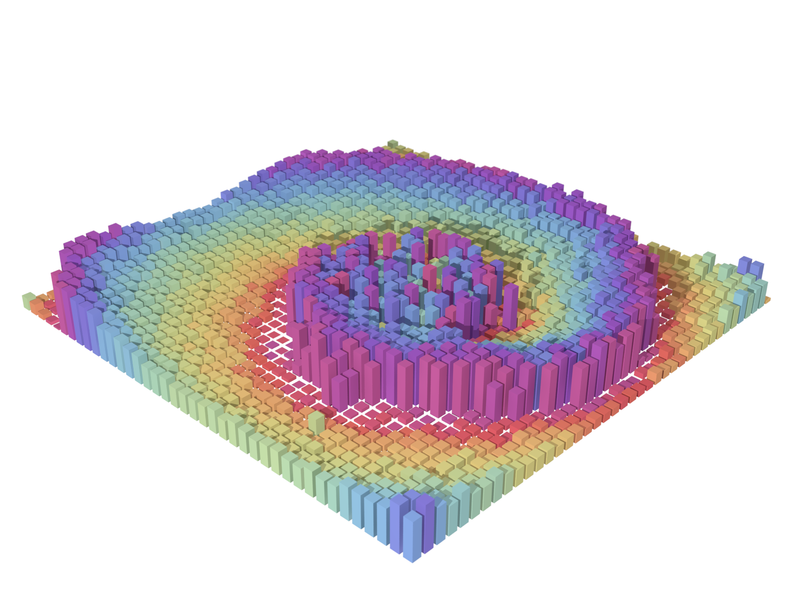 By numerical simulations in one spatial dimension, we cover extended parameter regimes of active tension and substrate friction, and reproduce experimentally observed oscillation periods and amplitudes. In line with recent experiments, the model predicts alternating forward and backward fluid flow at the boundaries with reversed flow in the center. Our model is a first step towards a more detailed model of moving microplasmodia of Physarum polycephalum. In two-dimensional reaction-diffusion systems, local curvature perturbations on traveling waves are typically damped out and vanish. However, if the inhibitor diffuses much faster than the activator, transversal instabilities can arise, leading from flat to folded, spatio-temporally modulated waves and to spreading spiral turbulence. Here, we propose a scheme to induce or inhibit these instabilities via a spatio-temporal feedback loop. 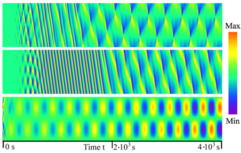 In a piecewise-linear version of the FitzHugh–Nagumo model, transversal instabilities and spiral turbulence in the uncontrolled system are shown to be suppressed in the presence of control, thereby stabilizing plane wave propagation. 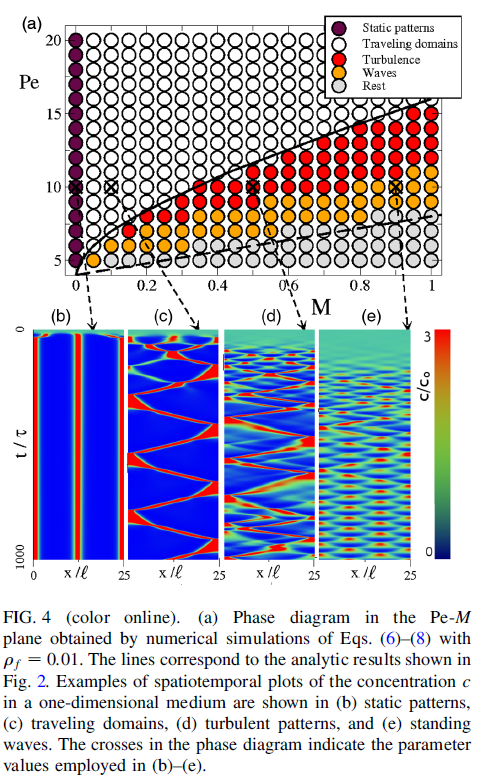 Conversely, in numerical simulations with the modified Oregonator model for the photosensitive Belousov–Zhabotinsky reaction, which does not exhibit transversal instabilities on its own, we demonstrate the feasibility of inducing transversal instabilities and study the emerging wave patterns in a well-controlled manner. The coexistence of coherent and incoherent dynamics in a population of identically coupled oscillators is known as a chimera state. Discovered in 2002, this counterintuitive dynamical behaviour has inspired extensive theoretical and experimental activity. The spiral wave chimera is a particularly remarkable chimera state, in which an ordered spiral wave rotates around a core consisting of asynchronous oscillators. 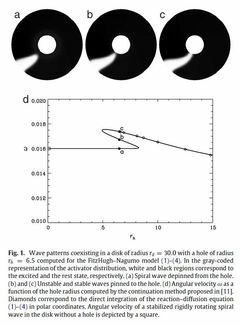 Spiral wave chimeras were theoretically predicted in 2004 and numerically studied in a variety of systems. 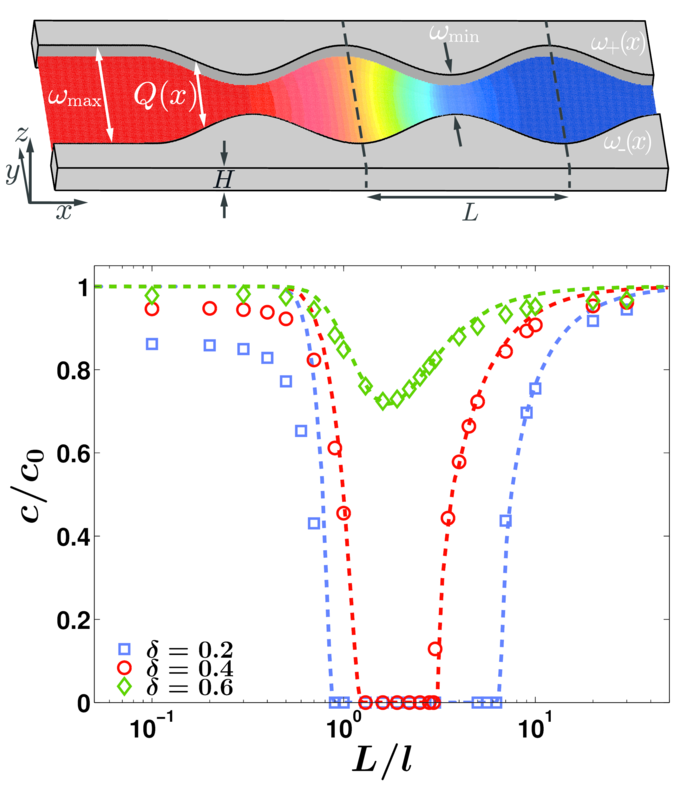 Here, we report their experimental verification using large populations of nonlocally coupled Belousov–Zhabotinsky chemical oscillators in a two-dimensional array. We characterize previously unreported spatiotemporal dynamics, including erratic motion of the asynchronous spiral core, growth and splitting of the cores, as well as the transition from the chimera state to disordered behaviour. Spiral wave chimeras are likely to occur in other systems with long-range interactions, such as cortical tissues, cilia carpets, SQUID metamaterials and arrays of optomechanical oscillators. J. F. Totz, J. Rode, M. R. Tinsley, K. Showalter, and H. Engel, Nature Physics, s41567-017-0005-8 (2017). The cytoskeleton of the organism Physarum polycephalum is a prominent example of a complex active viscoelastic material wherein stresses induce flows along the organism as a result of the action of molecular motors and their regulation by calcium ions. Experiments in Physarum polycephalum have revealed a rich variety of mechanochemical patterns including standing, traveling and rotating waves that arise from instabilities of spatially homogeneous states without gradients in stresses and resulting flows. Herein, we investigate simple models where an active stress induced by molecular motors is coupled to a model describing the passive viscoelastic properties of the cellular material. Specifically, two models for viscoelastic fluids (Maxwell and Jeffrey model) and two models for viscoelastic solids (Kelvin–Voigt and Standard model) are investigated. Our focus is on the analysis of the conditions that cause destabilization of spatially homogeneous states and the related onset of mechano-chemical waves and patterns. We carry out linear stability analyses and numerical simulations in one spatial dimension for different models. In general, sufficiently strong activity leads to waves and patterns. The primary instability is stationary for all active fluids considered, whereas all active solids have an oscillatory primary instability. All instabilities found are of long-wavelength nature reflecting the conservation of the total calcium concentration in the models studied. While free scroll rings are non-stationary objects that either grow or contract with time, spatial confinement can have a large impact on their evolution reaching from significant lifetime extension [J.F. Totz, H. Engel, O. Steinbock, New J. Phys. 17, 093043 (2015)] up to formation of stable stationary and breathing pacemakers [A. Azhand, J.F. Totz, H. Engel, EPL 108, 10004 (2014). 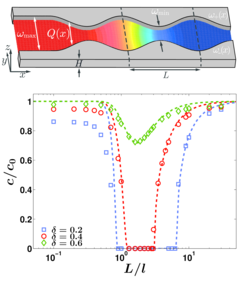 Here, we explore the parameter range in which the interaction between an axis-symmetric scroll ring and a confining planar no-flux boundary can be studied experimentally in transparent gel layers supporting chemical wave propagation in the photosensitive variant of the Belousov-Zhabotinsky medium. Based on full three-dimensional simulations of the underlying modified complete Oregonator model for experimentally realistic parameters, we determine the conditions for successful initiation of scroll rings in a phase diagram spanned by the layer thickness and the applied light intensity. Furthermore, we discuss whether the illumination-induced excitability gradient due to Lambert-Beer’s law as well as a possible inclination of the filament plane with respect to the no-flux boundary can destabilize the scroll ring. Chemical oscillators with a broad frequency distribution are photochemically coupled in network topologies. Experiments and simulations show that the network synchronization occurs by phase-lag synchronization of clusters of oscillators with zero- or nearly zero-lag synchronization. Symmetry also plays a role in the synchronization, the extent of which is explored as a function of coupling strength, frequency distribution, and the highest frequency oscillator location. The phase-lag synchronization occurs through connected synchronized clusters, with the highest frequency node or nodes setting the frequency of the entire network. The synchronized clusters successively “fire,” with a constant phase difference between them. For low heterogeneity and high coupling strength, the synchronized clusters are made up of one or more clusters of nodes with the same permutation symmetries. As heterogeneity is increased or coupling strength decreased, the phase-lag synchronization occurs partially through clusters of nodes sharing the same permutation symmetries. 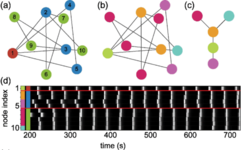 As heterogeneity is further increased or coupling strength decreased, partial synchronization and, finally, independent unsynchronized oscillations are observed. The relationships between these classes of behavior are explored with numerical simulations, which agree well with the experimentally observed behavior. J. F. Totz, R. Snari, D. Yengi, M. R. Tinsley, H. Engel, and K. Showalter, Phys. Rev. E 92, 022819 (2015). We study the impact of spatial confinement on the dynamics of three-dimensional (3D) excitation vortices with circular filaments. In a chemically active medium we observe a decreased contraction rate of such scroll rings and even expanding ones, despite their positive filament tension. 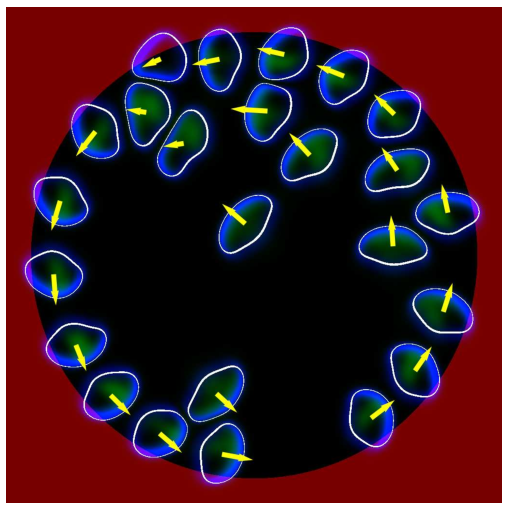 All experimentally observed regimes of spatially confined scroll ring evolution are reproduced by full 3D numerical integration of the underlying reaction–diffusion equations. Additionally, we propose a kinematical model that takes into account the interaction of the scroll ring with a no-flux boundary. Its predictions agree quantitatively with data obtained from simulations of the reaction–diffusion model. J. F. Totz, H. Engel, and O. Steinbock, New J. Phys. 17, 093043 (2015). J. Löber, F. Ziebert, and I. S. Aranson, Sci. Rep. 5, 9172 (2015). Propagation of traveling fronts in a three-dimensional channel with spatially varying cross-section is reduced to an equivalent one-dimensional reaction-diffusion-advection equation with boundary-induced advection term. Treating the advection term as a weak perturbation, an equation of motion for the front position is derived. We analyze channels whose cross-sections vary periodically with L along the propagation direction of the front. Taking the Schlögl model as representative example, we calculate analytically the nonlinear dependence of the front velocity on the ratio L/l where l denotes the intrinsic front width. In agreement with finite element simulations of the three-dimensional reaction-diffusion dynamics, our theoretical results predicts boundary-induced propagation failure for a finite range of L/l values. In particular, the existence of the upper bound of L/l can be completely understood based on the linear eikonal equation. Lastly, we demonstrate that the front velocity is determined by the suppressed diffusivity of the reactants for L < l.
S. Martens, J. Löber, and H. Engel, Phys. Rev. E 91, 022902 (2015). In experiments with the photosensitive Belousov-Zhabotinsky (PBZ) reaction we found a stable three-dimensional organizing center that periodically emits trigger waves of chemical concentration. The experiments are performed in a parameter regime with negative line tension using an open gel reactor to maintain stationary non-equilibrium conditions. The observed periodic wave source is formed by a scroll ring stabilized due to its interaction with a no-flux boundary. Sufficiently far from the boundary, the scroll ring expands and undergoes the negative line tension instability before it finally develops into scroll wave turbulence. Our experimental results are reproduced by numerical integration of the modified Oregonator model for the PBZ reaction. Stationary and breathing self-organized pacemakers have been found in these numerical simulations. In the latter case, both the radius of the scroll ring and the distance of its filament plane to the no-flux boundary after some transient undergo undamped stable limit cycle oscillations. In contrary to their stationary counterpart, the numerically predicted breathing autonomous pacemaker so far has not been observed in the chemical experiment. Self-propelled motion, emerging spontaneously or in response to external cues, is a hallmark of living organisms. Systems of self-propelled synthetic particles are also relevant for multiple applications, from targeted drug delivery to the design of self-healing materials. Self-propulsion relies on the force transfer to the surrounding. While self-propelled swimming in the bulk of liquids is fairly well characterized, many open questions remain in our understanding of self-propelled motion along substrates, such as in the case of crawling cells or related biomimetic objects. How is the force transfer organized and how does it interplay with the deformability of the moving object and the substrate? 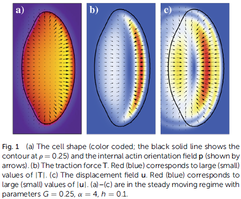 How do the spatially dependent traction distribution and adhesion dynamics give rise to complex cell behavior? How can we engineer a specific cell response on synthetic compliant substrates? Here we generalize our recently developed model for a crawling cell by incorporating locally resolved traction forces and substrate deformations. 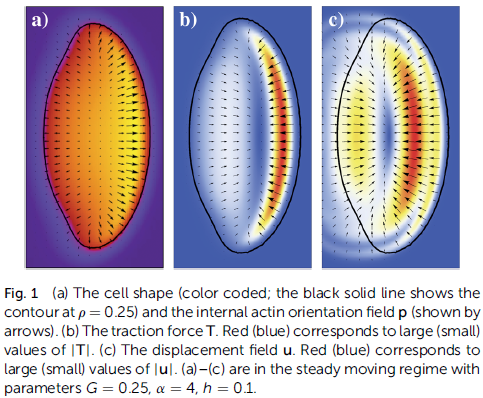 The model captures the generic structure of the traction force distribution and faithfully reproduces experimental observations, like the response of a cell on a gradient in substrate elasticity durotaxis). It also exhibits complex modes of cell movement such as “bipedal” motion. Our work may guide experiments on cell traction force microscopy and substrate-based cell sorting and can be helpful for the design of biomimetic “crawlers” and active and reconfigurable self-healing materials. Many processes in living cells are controlled by biochemical substances regulating active stresses. The cytoplasm is an active material with both viscoelastic and liquid properties. We incorporate the active stress into a two-phase model of the cytoplasm which accounts for the spatiotemporal dynamics of the cytoskeleton and the cytosol. The cytoskeleton is described as a solid matrix that together with the cytosol as an interstitial fluid constitutes a poroelastic material. We find different forms of mechanochemical waves including traveling, standing, and rotating waves by employing linear stability analysis and numerical simulations in one and two spatial dimensions. We study the role of the control parameter triggering nematic order (temperature or concentration) on the dynamical behavior of a system of nanorods under shear. Our study is based on a set of mesoscopic equations of motion for the components of the tensorial orientational order parameter. We investigate these equations via a systematic bifurcation analysis based on a numerical continuation technique, focusing on spatially homogeneous states. Exploring a wide range of parameters we find, unexpectedly, that states with oscillatory motion can exist even under conditions where the equilibrium system is isotropic. 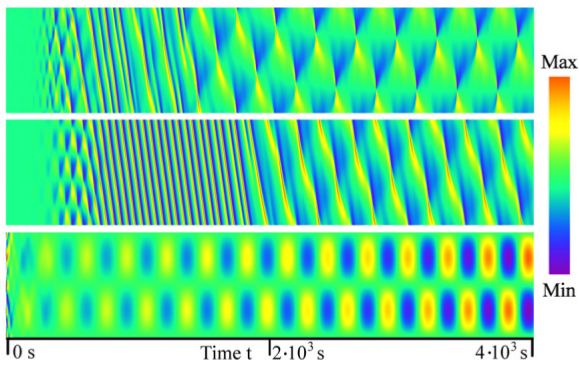 These oscillatory states are characterized by a wagging motion of the paranematic director, and they occur if the tumbling parameter is sufficiently small. We also present full nonequilibrium phase diagrams in the plane spanned by the concentration and the shear rate. Supernormal conduction (SNC) in excitable cardiac tissue refers to an increase of pulse (or action potential) velocity with decreasing distance to the preceding pulse. Here we employ a simple ionic model to study the effect of SNC on the propagation of action potentials (APs) and the phenomenology of alternans in excitable cardiac tissue. We use bifurcation analysis and simulations to study attraction between propagating APs caused by SNC that leads to AP pairs and bunching. It is shown that SNC stabilizes concordant alternans in arbitrarily long paced one-dimensional cables. 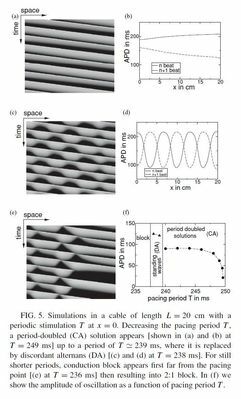 As a consequence, spiral waves in two-dimensional tissue simulations exhibit straight nodal lines for SNC in contrast to spiralling ones in the case of normal conduction. 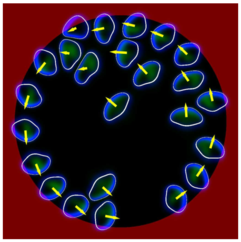 A mechano-chemical model for the spatiotemporal dynamics of free calcium and the thickness in protoplasmic droplets of the true slime mould Physarum polycephalum is derived starting from a physiologically detailed description of intracellular calcium oscillations proposed by Smith and Saldana (Biopys. J. 61, 368 (1992)). 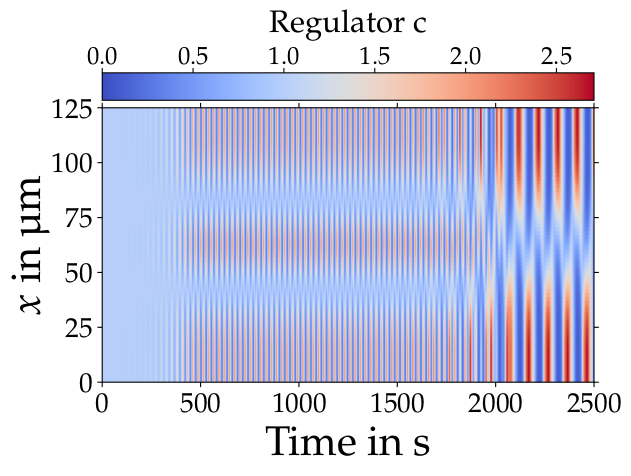 First, we have modified the Smith-Saldana model for the temporal calcium dynamics in order to reproduce the experimentally observed phase relation between calcium and mechanical tension oscillations. Then, we formulate a model for spatiotemporal dynamics by adding spatial coupling in the form of calcium diffusion and advection due to calcium-dependent mechanical contraction. In another step, the resulting reaction-diffusion model with mechanical coupling is simplified to a reaction-diffusion model with global coupling that approximates the mechanical part. We perform a bifurcation analysis of the local dynamics and observe a Hopf bifurcation upon increase of a biochemical activity parameter. The corresponding reaction-diffusion model with global coupling shows regular and chaotic spatiotemporal behaviour for parameters with oscillatory dynamics. In addition, we show that the global coupling leads to a long-wavelength instability even for parameters where the local dynamics possesses a stable spatially homogeneous steady state. This instability causes standing waves with a wavelength of twice the system size in one dimension. 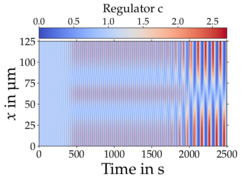 Simulations of the model in two dimensions are found to exhibit defect-mediated turbulence as well as various types of spiral wave patterns in qualitative agreement with earlier experimental observation by Takagi and Ueda (Physica D, 237, 420 (2008)). Hysteresis in the pinning-depinning transitions of spiral waves rotating around a hole in a circular shaped two-dimensional excitable medium is studied both by use of the continuation software AUTO and by direct numerical integration of the reaction-diffusion equations for the FitzHugh-Nagumo model. In order to clarify the role of different factors in this phenomenon, a kinematical description is applied. It is found that the hysteresis phenomenon computed for the reaction-diffusion model can be reproduced qualitatively only when a nonlinear eikonal equation (i.e. velocity-curvature relationship) is assumed. However, to obtain quantitative agreement, the dispersion relation has to be taken into account. 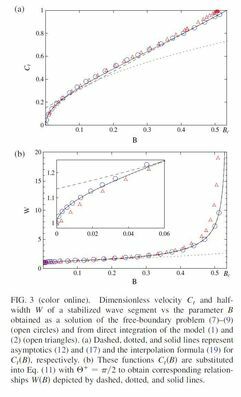 A free-boundary approach is applied to derive universal relationships between the excitability and the velocity and the shape of stabilized wave segments in a broad class of excitable media. In the earlier discovered low excitability limit wave segments approach critical fingers. We demonstrate the existence of a second universal limit (a motionless circular shaped spot) in highly excitable media. Analytically obtained asymptotic relationships and interpolation formula connecting both excitability limits are in good quantitative agreement with results from numerical simulations. 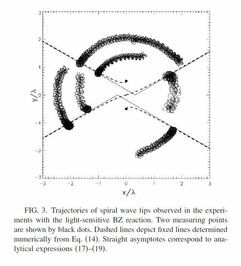 The drift velocity field describing spiral wave motion in an excitable medium subjected to a two-point feedback control is derived and analyzed. Although for a small distance d between the two measuring points a discrete set of circular shaped attractors are observed, an increase of d induces a sequence of global bifurcations that destroy this attractor structure. These bifurcations result in the appearance of smooth unrestricted lines with zero drift velocity, similarly to zero intensity lines under destructive interference in linear optics. The existence of such unusual equilibrium manifolds is demonstrated analytically and confirmed by computations with the Oregonator model as well as by experiments with the light-sensitive Belousov-Zhabotinsky reaction.